Trigger finger is a common condition that affects hundreds of thousands of people each year in the United States. Tendons connect bones to muscles in the body. Flexor tendons of the thumb and fingers pull the fingers into a fist. The tendons are enclosed in a synovial sheath. 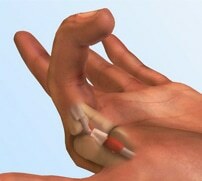 When this sheath and or tendon becomes inflamed it is called trigger finger. This often occurs due to repeated "gripping" actions, when the tendon can no longer pass through the tendon sheath, much like fishing line passing through guide rings on a fishing rod. The sheath acts as a guide for the tendon and as swelling worsens, the tendon meets increasing resistance, which ultimately can produce a locking of the finger, or may produce a snapping sound, giving it the name "trigger finger." It can often be painful and is more common in women and people with diabetes. People who utilize repetitive gripping actions are also more likely to develop the condition.